On a blog I recently started following, She Breathes Deeply, there is a giveaway for jewelry from The Noonday Collection . The website features fair trade jewelry, accessories and home decor. Who doesn't like helping others while helping themselves to beautiful things? "our passion at noonday collection is to connect you with the lives of artisans struggling for a better future while styling you along the way. fashion and design are a vehicle for opportunity and change. you, too, can be a voice for the oppressed!" 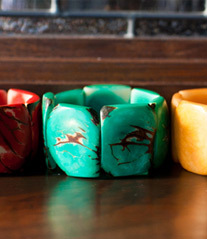 I really like these Tagua seed bracelets. Those bracelets are beautiful! Adorable blog, btw! I love so much of their jewelry! And thank you! No problem!I'm so glad I read it, can't stop looking at all the pretty things! !